This book is about money. It is about how money influences our lives. What we know about that and what is hidden. But above all, it is about how societies can move towards money that serves us instead of imposing rules that are leading to the destruction of the environment and a future of diminished opportunities for millions of people. You will get a totally new and different perspective on the economy, money, and banking! You may send a copy of this book to family and friends. 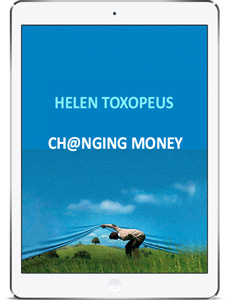 Please share the e-pub of the book on Facebook, LinkedIn or spread this url (https://www.socialtrade.org/changing-money/) where the book can be downloaded. Think big, read slow, share fast. Reading this book will challenge you to think in new ways. It is wise to take your time. All of us are known to have good intentions when we start reading a book, but often it takes time to finish it. So, if while reading you feel inspired, please do not hesitate —start to share this book. Together we can link the whole world. In a maximum of six steps, your book might be passed on to every changemaker on Earth! Together we can reach out to enthusiastic people but also to opinion leaders, community leaders, business networks, and foundations that support the common good. Start the link to foundations with missions supporting underperforming communities that can benefit the most! If we want to ch@nge money, we need a lot of people to join together. The book has been translated from the original Dutch version to English and Spanish. Let all your Spanish, English and Dutch friends know about the book! “Traditional” poverty stricken regions and areas, but also places in, for example, the USA that suffer from the polarization of the American economy. Please let us know where local governments, NGOs, and community organizations are ready to start the ch@nge. Join the crowdfunders who will enable the first showcase to maximize the impact of remittances. Read more about the crowdfunding here.